I need black laser ink, not a cartridge, for the Xerox WorkCentre M20i? The Xerox WorkCentre M20i can perform a number of tasks that will have you using your WorkCentre M20i over and over again because the Xerox WorkCentre M20i is incredibly user friendly, efficient and reliable. Constructed by Xerox with the average user in mind, the Xerox WorkCentre M20i is so efficient that the Xerox WorkCentre M20i can create up to 22 pages per minute, so you know that you can rely on your Xerox WorkCentre M 20i in a demanding or stressful situation. Constant use of your Xerox WorkCentre M-20i can become a problem financially because the Xerox WorkCentre M20i needs a range of Xerox WorkCentre M-20i cartridges to work, like the black Xerox WorkCentre M20i toner cartridge. There are many WorkCentre M 20i toner suppliers who are more than willing to raise the prices of their Xerox WorkCentre M20i cartridges because they know you need those Xerox WorkCentre M20i toner cartridges to function, so constantly repurchasing new Xerox WorkCentre M 20i cartridges can be expensive. We at CartridgeSAVE, however, are ready to find you cheap Xerox WorkCentre M20i toner cartridges-just compare our discount Xerox WorkCentre M20i toner prices with other leading Xerox WorkCentre M20i toner cartridge stores to find out! Allowing you to save on your Xerox WorkCentre M20i toner is what we’re all about so we supply the Xerox WorkCentre M20i toner cartridge with a number of great services, making sure you get the most out of purchasing your Xerox WorkCentre M20i cartridges from us. We send the Xerox WorkCentre M20i toner off with free delivery, for example, which ensures you don’t pay anything extra once you’ve bought your new WorkCentre M-20i cartridge. Buying Xerox WorkCentre M-20i toner from the internet can be risky because you’re unable to inspect the quality of the Xerox WorkCentre M20i toner cartridge that you’ve bought, so we operate a straight forward money back guarantee for every Xerox WorkCentre M20i cartridge, which allows you to inspect the Xerox WorkCentre M20i toner you’ve bought and see whether the Xerox WorkCentre M-20i toner cartridge works for you. Designed for workgroups with demanding printing needs, the Xerox WorkCentre M20i is multifunction monochrome laser printer with a monthly duty cycle of 20,000 pages and a resolution of 600 x 600 dpi. The Xerox M20i multifunction copier printer delivers excellent text quality and offers stand-alone e-mail and scanner functionality. The print speed of the Xerox WorkCentre M-20i mono printer is quite slow for a laser printer, however. This unit weighs 30 kg and measures 540 x 441 x 619 mm. The M20i laser multifunction printer has a 50-sheet automatic document feeder on top of the scanner and a 100-sheet bypass and 550-sheet input tray below the output tray. The Xerox WorkCentre M20i multifunction printer can handle a maximum of 1,200 sheets and has a print speed of 22 ppm for letter-sized media. For connectivity, users may choose from the parallel or USB interfaces. Ethernet connectivity is also offered. The Xerox WorkCentre M20i is very easy to use, thanks to its organised control panel and LCD display. The WorkCentre M20i copier printer has built-in Ethernet making it an ideal choice for workgroups. 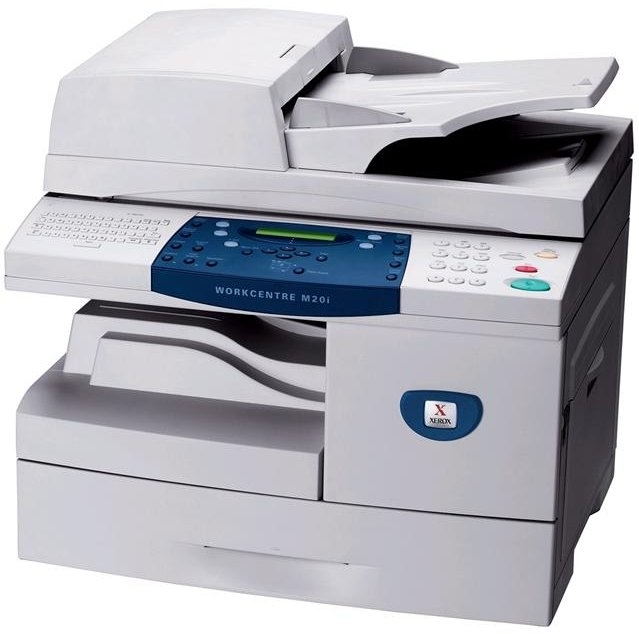 Print, scan, copy, and fax output are superior, and the Xerox WorkCentre M20i comes with an automatic document feeder plus an automatic duplexer. The original Xerox WorkCentre M20i toner can produce up to 20,000 black and white pages and comes at a very reasonable price. The Xerox M20i mono laser printer could be more efficient if it had scan-to or print-from USB functions. For a laser printer, the Xerox WorkCentre M20i is slow, printing only 22 ppm. There are inkjet printers that are much faster.